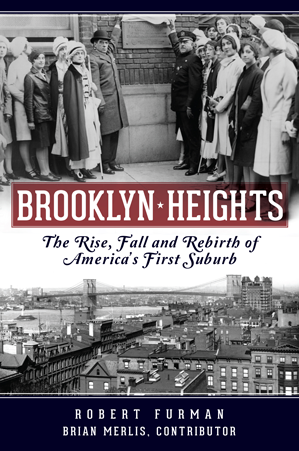 Settled in the 1600s, Brooklyn Heights is one of New York's most historic neighborhoods. Its strategic location overlooking the harbor proved instrumental during the Revolutionary War's Battle of Brooklyn. In the 1830s, steam ferries transformed it into America's first suburb, where abolitionism flourished and one of the largest Civil War Sanitary Fairs was held. Throughout the nineteenth century, wealthy philanthropists and entrepreneurs built high-styled Gothic Revival and Italianate homes and founded many landmark Brooklyn institutions. Though the neighborhood declined with the new century, it became a target of Robert Moses's urban renewal projects in the 1930s. Its designation as the city's first historic district saved Brooklyn Heights, and it has since blossomed into one of the city's most desirable neighborhoods. Robert Furman is the president of the Brooklyn Preservation Council Foundation. Since 2001, he has also worked as executive director of Old Stone House, president and founder of Brooklyn Heritage, Inc., and president of Four Borough Neighborhood Preservation Alliance. In addition, he is an active member of the Society of Old Brooklynites and the Bay Ridge Historical Society.